The Metroid universe (メトロイド, Metroid) refers to the Smash Bros. series' collection of characters, stages, and properties that hail from Nintendo's famous Metroid series of science-fiction adventure games. It is one of the company's most successful franchises. The series has had eleven official games released thus far, with most of them being near-universally praised by critics and gamers alike. The series also has a compilation (Metroid Prime Trilogy) and two enhanced remakes (Zero Mission and Samus Returns). The main series revolves around the space-faring bounty-hunting exploits of a woman named Samus Aran trying to stop the terrors brought about by the parasitic Space Pirates and their monstrous commander, Ridley, while the Prime subseries revolves around Samus stopping the sentient mutagen substance Phazon and its avatar Dark Samus. After the incredible success of Super Mario Bros. and The Legend of Zelda for the Famicom/NES, Nintendo began work on Metroid, an action game inspired by Ridley Scott's 1979 sci-fi horror film Alien. Nintendo set the game in the labyrinthine, subterranean cave network of a science-fiction alien planet to help impress a feeling of desperation and solitude on the player, and attempted to set the game apart from other games by making it a nonlinear adventure-based game that required exploration and backtracking. Like Zelda, Metroid helped pioneer the concept of acquiring permanent tools during the quest that would open up the way forward once the player returned to earlier areas. Metroid was also one of the first games to contain multiple endings, which were awarded based on how fast the game was completed; this had a hand in popularizing the concept of the "speedrun". Finally, Metroid was one of the first video games to feature a female protagonist - and this was initially presented to the gaming public as a concealed secret until the game was beaten in a fast-enough time. For all these reasons and more, the August 1987 release of Metroid for the NES was another revolutionary and enormously successful release for Nintendo. Metroid had a palpable effect on the future of the video game industry, integrating what was technically several styles of gameplay that had already revolutionized the industry on separate prior occasions into a new formula that was married with a foreboding atmosphere. The revelation that the player-character, Samus Aran - appearing as a suited, mechanized soldier that the instruction manual referred to with masculine pronouns - was a woman underneath the armor plating was lauded as innovative for blowing away established norms of females in video games (like the damsels in distress in Mario and Zelda). Many retrospectives, however, find faults with some of the original game's design and layout in comparison to modern action-adventure standards, and these shortcomings were only partially addressed in the first sequel, Metroid II: Return of Samus, released for Game Boy in November 1991. Samus fighting her archnemesis, Ridley, as depicted in the opening movie of Melee (based on Super Metroid). But by far the most significant evolution of the Metroid formula was the seminal Super Metroid, released on the SNES in April 1994. With vastly refined combat, exploration mechanics, world design, and dialogue-free storytelling, the game garnered universal acclaim and is often labeled by official publications as not only one of the best games on the SNES, but also one of the best video games ever made. The greatest irony is that the American and PAL versions of Super Metroid sold well as a result of aggressive marketing by Nintendo that was spurred on by the game's poor sales in Japan. Analysts proclaim that the Japanese release of Super Metroid was poorly timed, not only because of more commercially successful games being released at the time like Donkey Kong Country, but because of the launches of the next-generation systems Sony PlayStation and Sega Saturn. This was a big contributing factor to what became a now-legendary eight-year hiatus for the series, which remained dormant despite Samus' appearance in Super Smash Bros. on the Nintendo 64, and Nintendo mentioning the possibility of an N64 installment which had never came to fruition. The franchise would continue its presence in the Super Smash Bros. series as Samus reprised her role in Melee, but no new core entry appeared to be on the horizon. The rebirth of the Metroid franchise at the end of 2002 was arguably one of the most daring and ambitious for any video game franchise; two completely separate, high-profile Metroid titles were released on the same day in the Americas, on November 17, 2002. The first was Metroid Fusion for the Game Boy Advance, which was an all-new adventure based on the familiar two-dimensional sidescrolling formula of Super Metroid. However the more noteworthy title by far was Metroid Prime for the Nintendo GameCube, the series' inaugural transition into the third dimension, which was highly controversial prior to release. Not only was it being developed by a then-unknown company in the United States, the Texas-based Retro Studios, but its presentation with a first-person perspective led to accusations of being a complete departure from the Metroid fabric. The released product ultimately allayed these concerns, to say the least; Metroid Prime garnered extremely enthusiastic acclaim from critics and fans for managing the task of faithfully transplanting the classic formula into three dimensions and using the first-person viewpoint to its advantage and became one of the GameCube's bestselling titles as a result, securing the franchise’s place as a Nintendo staple for the foreseeable future. Samus's Zero Suit, worn beneath her Power Suit, was introduced in Zero Mission and replaced previous depictions of unsuited Samus. Trophy of Power Suit Samus from Brawl. Throughout the 2000s, the Metroid franchise settled into a more regular release schedule following Prime and Fusion. Metroid: Zero Mission, for the Game Boy Advance in February 2004, was a remake and expansion of the original Metroid that incorporated elements and design choices from future installments such as the control scheme, power-ups, and movement mechanics. The key difference from the original was that while the first game allowed Samus to be playable without her armor using a cheat code, Zero Mission established Samus' abilities when outside of the Power Suit, making Samus playable in the new "Zero Suit" as part of the narrative. Metroid Prime 2: Echoes, for the GameCube in November 2004, was a Prime follow-up that changed several concepts and was tuned to a much higher level of difficulty. Metroid Prime Hunters was an ambitious effort to present the graphically intensive Metroid Prime first-person formula on the restrictive hardware of the Nintendo DS in March 2006. Retro Studios concluded the Metroid Prime subseries (albeit temporarily) with the August 2007 release of Metroid Prime 3: Corruption for the Wii. The final chapter in the core trilogy, the game introduced immersive pointer controls to the series for controlling Samus and aiming her weapons, which were carried over to the Wii rereleases of the first two Prime games (all three games were later bundled as the limited-edition Metroid Prime Trilogy compilation for Wii, which eventually came to the Wii U eShop for digital download in January 2015 after the physical version went out of print). After the conclusion of the Prime trilogy, Metroid: Other M was introduced in August 2010 for the Wii, developed by Team Ninja of Ninja Gaiden fame. Its new third-person action-adventure gameplay aspects were generally well-received; however, some reviewers criticized its strikingly linear approach to level design, approach to characterization of Samus, the voice acting and dialogue (with the English dub directed by the non-English-speaking Sakamoto), and the game's methods of telling a cutscene-heavy story, with these aforementioned elements causing a high degree of fan controversy and backlash. This, combined with the game’s poor sales outside of Japan, dealt a critical blow to the series’s success streak and marked the beginning of a second hiatus for the franchise. During the Nintendo Digital Event at E3 2015, a new game in the series, Metroid Prime: Federation Force, was announced for the Nintendo 3DS and is a spin-off of the Metroid Prime series, with a 2016 release. The game is a co-op first-person shooter, where the player assumes the role of a faceless Galactic Federation Marine and featuring gameplay elements similar to that of Metroid Prime Hunters. The game also featured a side mode called “Blast Ball” in which two teams of four Federation troops blast a large soccer ball to the other team’s goal. Much like Other M before it, the game was met with a highly polarized reception for its graphical style, heavily reduced focus on Samus, focus on FPS combat over exploration, and its overall departure from the series's general tone. Further criticism was aimed at the fact that the first Metroid game announced after the franchise's five-year hiatus was a spin-off title and not a core entry in either the 2D series or the Prime series. With the controversy surrounding both Other M and Federation Force, as well as the five-year hiatus between them, the early-to-mid 2010s marked a period of uncertainty surrounding the state of the Metroid series. However, two new Metroid games were announced during E3 2017 - Metroid Prime 4 for the Nintendo Switch, and Metroid: Samus Returns, an enhanced remake of Metroid II: Return of Samus, for the Nintendo 3DS developed by MercurySteam who previously handled the Castlevania: Lords of Shadow subseries. The latter title would release the same year in September and the reveal of these two games marked the true end of the main series' hiatus and, together with a new sub-line of Metroid amiibo, signaled the return of Metroid as one of Nintendo's flagship franchises. While Samus Returns saw incredibly positive reception from fans and critics for bringing the series back to its roots, information on Metroid Prime 4 was hazy at best. Shortly after the game's teaser announcement, it was confirmed that longtime developer Retro Studios would not be returning for this latest entry. Instead, it would be handled by an unspecified new development team. Roughly two years later, even after the series saw an increase in representation in Super Smash Bros. Ultimate, it was announced in January 2019 that the game's development would be restarted from scratch. Shinya Takahashi cited development struggles under the new team to meet the quality standards of the previous Metroid Prime titles and the expectations of series fans. As a result, Prime series producer Kensuke Tanabe would restart the game's development, but with none other than the original team at Retro Studios. Overall, the Metroid series is often held up as one of Nintendo's greatest classic franchises and maintains a dedicated fanbase, particularly in the West. Super Metroid and the Metroid Prime trilogy in particular have garnered significant praise from fans and reviewers. Samus herself, while not achieving the same level of recognition as Mario or Link, is widely praised as one of Nintendo's most iconic heroines and a groundbreaking example of proactive female protagonists in gaming. Metroid / Metroid: Zero Mission: Samus' first mission is is to infiltrate the formerly Chozo-inhabited planet Zebes, since overtaken by Space Pirates, and destroy their standing forces and their stable of Metroids. Along the way, Samus battles the foremost "enforcers" of the Space Pirates - the colossal reptilian Kraid and the dragon-like Ridley (likely named after Alien director Ridley Scott) - and ends up battling the organic artificial intelligence helping dictate Pirate operations, Mother Brain. Immediately after a seemingly successful mission, however, Samus runs into some bad luck during her escape attempt, and is forced to find a way off the planet in just a body suit while equipped with a stun gun. After successfully escaping, Samus is able to harness the power of the ancient Legendary Power Suit (which more closely resembles her usual design) by proving herself at the Chozodia temple. With her newfound power, she tears through the Space Pirate mothership, destroys a giant robot shaped in Ridley’s likeness, and narrowly escapes the planet intact. Metroid Prime: Samus tracks remnants of the Space Pirates to another outpost on the planet Tallon IV, and she discovers that they are experimenting on augmenting their capacity for warfare with a mysterious mutagenic substance called Phazon, which was brought to the planet by an enigmatic meteor strike long ago. She destroys the Space Pirates' research and standing forces once again, but along the way inadvertently allows for the incidental birth of a dark opposite to herself, the sentient Phazon entity Dark Samus. Metroid Prime Hunters: When the Galactic Federation receives a mysterious telepathic message that the key to the "ultimate power" resides in the Alimbic star system, Samus is sent to investigate and possibly retrieve it, but six other rival bounty hunters from different alien species compete for the same goal. Metroid Prime 2: Echoes: The Galactic Federation loses contact with a Federation marine vessel that engages a Space Pirate vessel near another Space Pirate outpost planet named Aether, and Samus is sent to investigate. She discovers the planet was struck by a similar Phazon meteor in its past, which has split the planet into light and dark dimensions. Samus must not only separately contend with the Space Pirates and Dark Samus itself, but even more threatening shadow creatures from the dark dimension, the Ing, who threaten the peaceful Luminoth race. Metroid Prime 3: Corruption: With the Space Pirates' Phazon-based operations now in disarray from Samus' meddling, the Space Pirates turn to a rejuvenated Dark Samus for aid, and allow themselves to get indoctrinated by the entity. Dark Samus seeks to corrupt the galaxy with Phazon and has the Space Pirates launch simultaneous attacks on separate Federation planets, and Samus herself gets her suit corrupted during the struggle. Granted new technology that allows herself to harness her own suit's Phazon corruption, Samus goes on a planet-hopping quest to end the Phazon menace forever, even as her fellow bounty hunters become corrupted and turn against her. Along the way, Samus realizes the truth about the origin and nature of the Phazon-filled "living-meteors" called Leviathians. Samus reactivates the Valhalla and takes the fight to the planet Phaaze, the source of all Phazon and home of Dark Samus. After a hard-fought duel against both her dark doppelgänger and a corrupted Aurora Unit Samus ultimately prevails and Dark Samus is destroyed for the last time, along with the entirety of Phazon and the planet Phaaze. Thus the war on Phazon concludes, though not without a mysterious follower tracking Samus’s gunship through the stars. Metroid Prime: Federation Force: After Samus' elimination of the Phazon menace, the Space Pirates continue to serve as a threat in their own right. The Galactic Federation therefore initiates "Operation Golem" and deploys mech suits, controlled by elite Galactic Marines, in order to eliminate the Pirates. A significant Space Pirate presence is detected in the Bermuda System and the Marines are sent to eradicate them, with some assistance from Samus. After their success, a mysterious figure infiltrated their base containing a Metroid egg, which the figure then prematurely hatched. He presumably stole it under the noses of the Federation troops. Metroid II: Return of Samus / Metroid: Samus Returns: The Galactic Federation has deemed the Metroid species too great a threat to be allowed to live, and so tasks Samus to cull every individual specimen off the surface of the Metroid homeworld, SR388. Samus destroys Metroids that have matured into advanced, more monstrous forms, and squares off against the Metroid Queen itself, but at the end of her mission, she spares a lone hatchling and donates it to the Federation's research division on Ceres. Super Metroid: However, a revived Ridley raids the research division and takes back the hatchling by force, and Samus returns to Zebes on another mission to thwart the Space Pirates' last efforts to preserve and harness the species. She infiltrates the Space Pirates' reconstructed subterranean base on Zebes, and discovers and once again battles each of her classic foes - Kraid, Ridley, and the Mother Brain - before detonating the entire planet and achieving the extinction of the Metroid species. Metroid: Other M: Samus follows a distress signal towards a "Bottle Ship" floating near a Federation vessel, and discovers some of her companions from her days in the Federation military, including her former commanding officer Adam Malkovich, on board in the middle of a mission he does not tell Samus about at first. After Adam begrudgingly allows her to cooperate with the platoon, they discover the first signs of a darker side to the Federation. Metroid Fusion: While leading scientists on a Federation-sanctioned survey across SR388, Samus is attacked by a native parasitic lifeform, the X Parasite, that was originally kept in check by its natural predator, the Metroids. Samus survives, but becomes permanently bound to a "fusion" form of her suit. The research station floating above the planet later becomes infested with X Parasites that mimic other organisms, and so Samus, whose new form is immune to the infestation, is sent on a mission by the Federation to fight and wipe out the creatures. Or at least, that is what Samus thinks her mission is strictly about. Despite there being no Metroid game on the Nintendo 64, the Metroid franchise is represented as one of several "standard universes" found in Super Smash Bros.. There is a total of one character and one stage representing Metroid, both which focus on the original Metroid, and the recent Super Metroid. This game makes Samus's only appearance on the Nintendo 64. Samus: A bounty hunter in a technologically advanced and flexible power suit, Samus Aran is an orphan from a Space Pirate attack. She was harbored by the benevolent Chozo race at a young age and infused with their heritage and technology, and she now serves the Galactic Federation as pretty much a one-woman army against the menace of the Space Pirates and their attempts to use the life-stealing Metroids to conquer the universe. In Smash 64, Samus appears as a starter playable character. Her neutral special is the Charge Shot, a chargeable ball of energy that Samus shoots out of her arm cannon. Her up special is the iconic Screw Attack first appearing in the original Metroid. Samus's down special is her Bomb from the original Metroid. This moves makes Samus turn into Morph Ball mode and lay a bomb, which will explode either after a set time period or upon contact with a character. Planet Zebes: This stage is designed to resemble the general environment and hazards of the caverns of the titular planet that Metroid and Super Metroid take place in. It is a big platform with three platforms above it, and one on the right moving vertically. The stage features an ocean of acid that periodically rises up and submerges the lower portion of the stage. Touching the acid will damage a character and send them flying upward. Due to the acid, it is impossible, under normal conditions, to die by falling below the main platform. 8: A remix of the Brinstar music from the original Metroid for NES. It is heard on Planet Zebes. 18: The victory fanfare of Samus is an orchestration of the music heard when Samus finds a new item or power-up in general Metroid games. Much like the original Smash 64, there was no new Metroid game released before Melee, so the majority of Metroid representation is still from the original Metroid and Super Metroid. This game features much more Metroid content than Smash 64, including one returning character, two new stages, and a handful of trophies. This game also introduces the first Metroid item. Samus: Samus returns as a starter character, and as the only Metroid character, probably because of the nature of Metroid games and how they do not seem to feature notable supporting characters. As with all returning characters, Samus gained a new side special, being her Missile attack from Super Metroid. She points her arm cannon in front of her, and shoots either a Homing Missile or a Super Missile depending on how the control stick is tapped. Samus is considered as one of the two most buffed characters from Smash 64. Planet Zebes: Brinstar: This stage is the spiritual successor to the original Planet Zebes stage, and it features a nearly identical layout; aside from the visuals, the only real difference to this stage is that parts of the stage can be damaged by players attacks, and destroying these can cause the elevated platforms to rise upwards to steep angles and the big lower platform to break apart into two. A large brain-like creature appears in the background, shaking whenever the lava comes up to it. Planet Zebes: Brinstar Depths: This stage appears to be loosely based on Kraid's encounter in Super Metroid. A difficult stage to keep on top of, this is essentially a giant, craggy, circular mass of rock that floats above lava. The lava on the bottom of the screen does not damage the player like other Metroid stages, as it is merely a background effect symbolizing the blast line. The stage is routinely rotated by the gigantic alien monster Kraid in the background. It is impossible to grab onto any ledge in this stage. Screw Attack: An upgrade that Samus can obtain ever since the original Metroid. It allows Samus to somersault into enemies in the, killing many instantly. In Melee, a character can pick up this item and perform the same action once they jump, similar to Samus's own up special. The character can also hurl it at an opponent and the opponent will automatically jump up whirling. 7: Brinstar: A medley of three classic tunes from the original Metroid. First plays a techno remix of the first "Brinstar" area music. It is then followed by the short "game start" tune one hears whenever resuming a game file. Finally, a remix of the title screen plays before looping back into the first track. This is heard in the stage Brinstar, and acts as one of Samus's credits theme. 8: Brinstar Depths: A synth, techno remix of area music heard later on in the original Metroid, where Samus is particularly close to her encounter with Kraid. A bridge section consists of the short tune played in item rooms in the original Metroid. This is heard in the stage Brinstar Depths, and acts as one of Samus's credits theme. 41: Samus's Victory: The victory fanfare of Samus is an orchestration of the music heard when Samus finds a new item or power-up in general Metroid games. A fairly-decent amount of content from the Metroid franchise appears in Super Smash Bros. Brawl. Samus: Shown by trailers as a returning character for Brawl, Samus Aran has been visually touched up to look like her more detailed incarnation in the final sequence of Metroid: Zero Mission, but otherwise apparently retaining her gameplay. Her Final Smash, the Zero Laser, is a huge beam that literally blows off her own armor to become a pile of throwable Power Suit Pieces and renders her as a new playable character, Zero Suit Samus. Zero Suit Samus: The suitless version of Samus from Metroid: Zero Mission is playable via Samus' Final Smash. She fights acrobatically and carries a projectile attack in the form of her handheld Paralyzer gun, which she also uses as the basis for her Plasma Whip and Plasma Wire special attacks, both of which can be used for tether recovery. Zero Suit Samus' Final Smash involves a huge, blinding ball of light forming around her, returning her to status with the power suit. On the final character select screen (after all characters are unlocked), Samus shares the fourth column with fellow Famicom/NES-originated characters Ice Climbers, R.O.B., and Pit. Ridley: Samus's arch enemy Ridley makes an appearance in the Subspace Emissary as a boss that Samus and Pikachu encounter in a facility on the Island of Ancients shortly after Samus regains her Power Suit. It would seem he is working for the Subspace Army, but no information really exists on his storyline importance. Meta Ridley: Later in the game, when a slew of characters are escaping from the self-destructing Subspace Bomb Factory on Captain Falcon's Falcon Flyer, a rebuilt Ridley in the form as seen in Metroid Prime appears. While he is canonically just a modified Ridley, the fight plays out nothing like the previous Ridley fight. It is worth noting that Metroid is the only represented franchise to feature more than one boss fight. Metroid: A Metroid latches its body on a character's head and starts draining their health, increasing the character's damage percentage in the process. Norfair: A new stage set in the fiery depths of Zebes, this stage, like previous Metroid stages, features rising lava. In addition to this, lava can come from the sides of the screens too, as well as in an enormous wave from the background that forces players to fight to stay inside a temporary safe zone to avoid damage. Frigate Orpheon: Set in the opening area of the first Metroid Prime, which contains the Parasite Queen, this stage has an interesting twist. When the warning siren sounds, the stage flips, and what was once above the players becomes the new platforms to fight on. Melee Stages: Brinstar: One of the few stages to return from the previous game, it is mostly unchanged from Melee. See List of SSBB Music (Metroid series). Main Theme (Metroid) - A rock styled remix of the Brinstar theme from the first Metroid title. Aside from the vocals at the beginning of the track, this is taken almost directly from Metroid Prime Pinball, with the insertion of some extra instruments and the addition of the original Brinstar NES-like remix. It is used on the Norfair stage. Ending (Metroid) - An orchestrated version of the credits theme used in both the original Metroid and its remake, Metroid Zero Mission. It is used on the Norfair stage. This song is also played during both Samus and Zero Suit Samus' Classic Mode credits. Norfair - A quirky remix of the lesser-known Norfair theme from the original Metroid game. It is the theme of the Norfair stage. Theme of Samus Aran, Space Warrior - An orchestration of the credits theme of the SNES hit, Super Metroid. It is used on the Norfair stage. Vs. Ridley - A completely redone version of Ridley's theme that is featured in several Metroid games and originated in Super Metroid. It is used on the Frigate Orpheon stage. Vs. Parasite Queen - Taken directly from Metroid Prime, this was the track that played when Samus fought the Parasite Queen during the opening section of the game. It is used on the Frigate Orpheon stage. Opening/Menu (Metroid Prime) - A medley of two tracks from Metroid Prime--the title screen and the credits theme (which itself was an extension of the menu theme). With the exception of the vocals at the beginning, the title screen theme is taken directly from the game, while the credits theme is arranged. It is the theme of the Frigate Orpheon stage. Sector 1 - An orchestrated version of the background music of the first mission in Sector 1 in Metroid Fusion. It is used on the Frigate Orpheon stage. Vs. Meta Ridley - Taken directly from Metroid Prime, this was the background music that played during the fight against Meta Ridley. This same, unaltered track was also used in Metroid Prime 3: Corruption. It is used on the Frigate Orpheon stage. Multiplayer (Metroid Prime 2) - A track taken directly from the multiplayer mode of Metroid Prime 2: Echoes, which itself was a techno remix of the Brinstar background music from Super Metroid. It is used on the Frigate Orpheon stage. Brinstar (Melee) - Taken directly from Melee. It is used on the Brinstar stage. Brinstar Depths (Melee) - Taken directly from Melee. It is used on the Brinstar stage. Samus' victory theme - The "got item" fanfare featured in every single Metroid game to date, except Metroid: Other M.
The Metroid series is one of the better represented series in Smash 4. Not only do all characters from Brawl return with updated designs and most secondary content (the Screw Attack item, the Metroid Assist Trophy, the Ridley boss, most stages, and music), but it includes a wealth of new content, including two new Assist Trophies, a new stage, and two new music arrangements. Much of the new content derives from Metroid: Other M, which was released between the releases of Brawl and Smash 4 in 2010. Samus: a galactic bounty hunter who fights to eradicate the Metroid threat. Samus Aran was confirmed to return during the E3 2013 Nintendo Direct. This is the first Smash Bros. title where her orange Varia Suit is no longer based on its design in Super Metroid. It now reflects its design in Metroid: Other M, though it includes details not in the source material, such as perforated metal and black vents between the seams. Her Grapple Beam has been significantly improved as a grab and tether, and the speed of a fully powered Charge Shot has been increased. Due to limitations of the Nintendo 3DS hardware, Samus can no longer transform into Zero Suit Samus by any means. She has two new alternate costumes for 8-Player Smash: one is based on the Light Suit from Metroid Prime and the other is based on her rival from the Prime saga, Dark Samus. Zero Suit Samus: space warrior Samus Aran as she appears in the eponymous Zero Suit from Metroid: Zero Mission. She was confirmed to return during the dedicated April 2014 Smash Bros. Direct. Like Fox and Marth, Zero Suit Samus has a composite design that combines elements from several titles, including Zero Mission, Metroid Fusion, and Metroid: Other M. Uniquely to Smash, Samus is equipped with a pair of Jet Boots that emphasize buffs made to her kick-based attacks and jumps. Like the Grapple Beam, the Plasma Wire of her Paralyzer has been significantly improved as a tether. No longer bound to her Varia Suit, Zero Suit Samus summons her Gunship and fires powerful beams for her Final Smash. Samus's Armor (DLC): the outfit is based on Samus Aran's Power Suit from Other M. The costume was released as downloadable content on July 31, 2015. An official Mii based on Samus's likeness can be downloaded via QR code on the official site. Screw Attack (status): a badge from the original Metroid. When equipped, the player's first and second jumps are replaced with energized, rotating jumps that damage opponents on contact. It is an iconic item in the Metroid series and serves as the series icon in Smash. The Pic of the Day introducing Mother Brain as a new Assist Trophy. Metroid: the eponymous jellyfish-like parasite of the Metroid series. It hovers around the stage before attaching to a nearby opponent's head, inhibiting their motion and increasing their damage percentage. It does not attack the summoner. It also appears as an enemy in Smash Run and Smash Tour. Mother Brain: one of the main antagonists of the Metroid series. She is an enormous, disembodied brain with one unblinking eye. In Smash, she is restricted to here Control Capsule and attacks opponents with her Laser Brain Attack from Super Metroid. Though sessile, a swarm of Rinkas hover around her and cause damage on contact. Opponents can attack her to stall her attacks and make her disappear prematurely. She does not attack the summoner. Dark Samus: an antagonist from the Metroid Prime titles in the guise of Samus. She fires rapid-fire beams and large spheres of Phazon from her arm cannon to attack opponents. She does not attack the summoner. Metroid: the eponymous jellyfish-like parasite of the Metroid series. In Smash Run, it hovers around the stage before attaching to a nearby opponent's head, inhibiting their motion and increasing their damage percentage. It is most weak to ice-based attacks, an attribute carried over from the Metroid games. In Smash Tour, it steals stats from the first player it makes contact with on the board and grants the stats to whichever player bumps into it next. It also appears as an Assist Trophy. Geemer: an insectile creature from the original Metroid that scuttles on floors, walls, and ceilings. Its body is covered in spikes that cause damage to opponents on contact. It is most vulnerable to projectile attacks. It resembles its appearance in Super Metroid. A similar being appears in the Wii U version inside Master Fortress. Kihunter: a vespine creature from Super Metroid. It slashes at opponents with scythe-like claws and spits acid that temporarily stuns opponents. Its design comes from Metroid: Other M. Its larval form, Zero, appears on the Pyrosphere stage in the Wii U version. Reo: a cicada-like creature from Super Metroid. It hovers and swoops down at opponents in a "U" shaped trajectory, damaging opponents with its giant claws. Its design comes from Other M.
Ridley: the captain of the space pirates and Samus's arch nemesis. This incarnation of Ridley comes from Metroid: Other M and he is the stage boss of Pyrospehere. Unlike Yellow Devil and Metal Face, Ridley's moveset is similar to that of a playable character, just on a much larger scale. He swipes at opponents with his claws and tail, and he fires balls of flame from his mouth. If he is accumulates enough damage, he can fight alongside one of the players. He can also be launched, and players earn points for KOing him. He appears on the Smash Tour board as well in a dedicated "Boss Battle" triggered by the first player to make contact with him. The victor is awarded an huge loot of stats. Files left in the 3DS version suggests that he was intended to appear in Smash Run in some unknown capacity. All Metroid stages are starter stages. Brinstar: staged in a cavernous area on Planet Zebes, the setting of the original Metroid and Super Metroid. Acid rises and falls at the bottom of stage and burns players on contact. What resembles a massive egg sac wiggles in the distance, and a Chozo statue is in the immediate background. The acid is more vibrant than it was in Brawl, likely to stand out more on the 3DS's screen. It is one of the possible stages to appear in Level 2 of All-Star Mode as a home stage for Samus. Its Ω form is a spacious floating platform like Final Destination. Pyrosphere: a spacious arena within the lava-filled sector of the Bottle Ship, the setting of Metroid: Other M. The primary platform is Pyrosphere's Geothermal Power Plant. Secondary floating platforms flank the Power Plant, making the stage similar to Pokémon Stadium 2. The main gimmick of the stage is that Ridley resides here as a stage boss. Otherwise, Joulions and FG II-Graham units appear as enemies that will attack nearby opponents. Zeros also appear but are harmless. They can be picked up and tossed at opponents. Pyrosphere is large enough to accommodate 8-Player Smash, but Ridley does not appear and the background lava is removed. It is one of the possible stages to appear in Level 2 of All-Star Mode as a home stage for Zero Suit Samus. Its Ω form is a spacious floating platform like Final Destination. Norfair: staged in a magma-filled cavern deep within Planet Zebes. Like Brinstar, the volatile magma sea rises and falls, often covering the lowermost platforms. Rushing waves of magma periodically engulf the stage's platforms and can only be avoided by entering the protective safe zones. The magma glows more intensely than it did in Brawl. Norfair is large enough to accommodate 8-Player Smash, but the magma does not rise. It is one of the possible stages to appear in Level 6 of All-Star Mode as a home stage for Samus. Its Ω form is a spacious floating platform like Final Destination. Title (Metroid): an arrangement of "Title" from the original Metroid. It plays on Pyrosphere. It is featured on Disc 2 of A Smashing Soundtrack. Escape: an arrangement of "Escape" from the original Metroid. It plays on Pyrosphere. Brinstar: an arrangement of "Brinstar Area" from the original Metroid. It plays on Brinstar and Norfair. It is featured on Disc 1 of A Smashing Soundtrack. Brinstar Depths: an arrangement of "Kraid's Lair" from Metroid. It plays on Brinstar and Norfair. Main Theme (Metroid): an arrangement of "Brinstar Area" from Metroid featuring opening narration by Jay Ward. It plays on Norfair. Norfair: a remix of "Norfair" from Metroid. It plays on Norfair. Ending (Metroid): an arrangement of "Ending" from Metroid. It plays on Norfair. Theme of Samus Aran, Space Warrior: an arrangement incorperating "Theme of Super Metroid" and "Theme of Samus Aran, Galactic Warrior" from Super Metroid. It plays on Norfair. Vs. Ridley: an arrangement of "Big Boss Confrontation 1" from Super Metroid. It plays on Pyrosphere. Sector 1: a remix of "Sector 1" from Metroid Fusion. It plays on Pyrosphere. Compositions and arrangements directly sourced from the Metroid series with no alterations. Vs. Parasite Queen: from Metroid Prime. It plays on Pyrosphere. Vs. Meta Ridley: from Metroid Prime. It plays on Pyrosphere. Multiplater (Metroid Prime 2: Echoes): though sourced from Metroid Prime 2: Echoes, the piece itself is a remix of "Brinstar Overgrown with Vegetation Area" from Super Metroid. It plays on Pyrosphere. Psycho Bits: from Metroid Prime Hunters. It plays on Pyrosphere. Lockdown Battle Theme: from Metroid: Other M. It plays on Pyrosphere. The Burning Lava Fish: from Other M. It plays on Norfair. Nemesis Ridley: from Other M. It plays on Pyrosphere. Victory! Metroid Series: an orchestrated flourish of the fanfare played when Samus obtains a power-up or an addition to her Power Suit in the original Metroid. This same flourish plays when she defeats Kraid or Ridley as well. It is sourced from Brawl. "Defeated is the monster!" by Eric from the Wii U Photo Contest. It features the Queen Metroid and Samus (Alt.) trophies. The Metroid series has undergone one of the most substantial expansions of the “perfect-attendance” franchises. Along with the two Smash 4 veterans returning with updated movesets, two newcomers were introduced with one being a unique fighter after being a stage boss and the other an Echo Fighter after being an Assist Trophy in the previous installment. The series's presence has also gone from being heavily skewed towards Other M to a more generous representation from across the franchise, including the Metroid Prime titles, even incorporating elements from the more recent installments on Nintendo 3DS. Many Spirits and several new music tracks both sourced and remixed round off rest of the representation of the entire Metroid franchise. Samus: The legendary bounty hunter returns as a member of the starting roster. Her appearance and moveset are largely unchanged from SSB4, being based on her Varia Suit from Other M, with a key difference being that Samus can now charge her Charge Shot in midair. Otherwise she has been heavily buffed to rely on a more patient and threatening playstyle. Zero Suit Samus: The suitless incarnation of the legendary bounty hunter is now an unlockable fighter after being a starter in Smash 4. Much like her Varia Suited counterpart, her design and moveset are derived from her previous appearance with a few changes, the most notable of which is a new Final Smash that has her temporarily don the Varia Suit and fire the Zero Laser from the top of her gunship. Otherwise, she has received a myriad of buffs and nerfs to rebalance her toolkit and not exploit certain techniques. Ridley: Samus's longtime archrival, Ridley, makes his debut as an unlockable newcomer in Ultimate. One of the largest playable characters, Ridley's design is largely inspired by his Super Metroid appearance, with some realistic details loosely similar to his Other M appearance. His moveset is animalistic in nature, relying on brutal offense to deliver massive damage particularly from his wings and tail. He can jump multiple times in the air, and some of his alternate costumes feature cybernetic enhancements. Dark Samus: Samus's Phazon-powered doppelgänger and chief antagonist from the Metroid Prime series, Dark Samus, makes her debut as an unlockable Echo Fighter with her design being based on Metroid Prime 3: Corruption. Some notable differences from her base character include floatier movement and jumps, attacking one-handedly, slightly faster rolls, a slightly smaller forward smash, and Phazon-inspired visuals to her attacks and taunts. Mother Brain: Returning unchanged from Smash 4. Metroid: Returns mostly unchanged from Brawl and Smash 4, but can now be defeated with freezing attacks, like in Smash Run. All Metroid stages except for Planet Zebes and Pyrosphere return from previous Smash games. Pyrosphere was removed most likely due to Ridley's playable appearance and Planet Zebes has been replaced by Brinstar. Brinstar: Returns as a retro stage. Brinstar Depths: Returns as a retro stage after a 17-year absence. Frigate Orpheon: Returns as a retro stage after being absent from Smash 4. Norfair: Returns as a retro stage. "Brinstar Depths": A new, violin-based arrangement of "Kraid's Chamber" from Metroid. "Vs. Ridley": A new arrangement of "Big Boss Confrontation BGM (Ridley, Draygon)" from Super Metroid, with some elements of “Theme of Samus Aran” sprinkled in as well. "Vs. Parasite Queen": An arrangement of "Vs. Parasite Queen" from Metroid Prime, replacing the original sourced theme from previous Smash games. "Brinstar (64)": A remix of "Brinstar" from Metroid. Returns from Smash 64. "Brinstar (Melee)": A medely of tracks from Metroid, including "Brinstar", "Samus Appears", and "Title". Returns from Melee. "Brinstar Depths (Melee)": A remix of "Kraid's Chamber" and "Silence" from Metroid. Returns from Melee. "Brinstar (Brawl)": A remix of the theme from the Pirate Frigate Table in Metroid Prime: Pinball, which itself is a remix of "Brinstar" from Metroid, featuring the narration of Jay Ward in the beginning. Returns from Brawl. "Norfair": A remix of "Norfair Area" from Metroid. Returns from Brawl. "Ending - Metroid": A remix of "Ending" from Metroid. Returns from Brawl. "Vs. Ridley (Brawl)": A remix of "Big Boss Confrontation BGM (Ridley, Draygon)" from Super Metroid. Returns from Brawl. "Sector 1": A remix of "Sector 1 (SRX)" from Metroid Fusion. Returns from Brawl. "Opening/Menu - Metroid Prime": A remix of "Metroid Prime Theme" and "Metroid Prime Credits" from Metroid Prime. Returns from Brawl. "Title Theme - Metroid": A remix of "Title" from Metroid. Returns from Smash for Wii U. "Escape": A remix of "Escape" from Metroid. Returns from Smash for Wii U. "Vs. Meta Ridley": The theme played when fighting Meta Ridley, sourced from Metroid Prime. "Multiplayer - Metroid Prime 2: Echoes": The default music of multiplayer maches, sourced from Metroid Prime 2: Echoes. "Psycho Bits": The theme played when fighting the Psycho Bit enemy, sourced from Metroid Prime Hunters. "Lockdown Battle Theme": The miniboss theme, sourced from Metroid: Other M.
"The Burning Lava Fish": The theme played when fighting Vorash, sourced from Metroid: Other M.
"Nemesis Ridley": The theme played when fighting Ridley, sourced from Metroid: Other M.
"Main Theme - Metroid Prime: Federation Force": The title theme, sourced from Metroid Prime: Federation Force. "Magmoor Caverns - Metroid: Samus Returns": The theme played in areas of extreme heat, which itself is a remix of the Magmoor Caverns theme from Metroid Prime, which itself is a remix of the Lower Norfair theme from Super Metroid, sourced from Metroid: Samus Returns. "Boss Battle 4 - Metroid: Samus Returns": The theme that plays when fighting a Zeta Metroid, sourced from Metroid: Samus Returns. "End Results - Metroid: Samus Returns": The theme played on the end screen, sourced from Metroid: Samus Returns. "Victory! Metroid Series": An orchestrated flourish of "Item Acquisition Fanfare" from Metroid. Unchanged from Brawl and Smash 4. "Victory! Metroid Villains": An intense and aggressive remix of "Item Acquisition Fanfare" from Metroid. Main character and Bounty Hunter Samus Aran is playable in all five Super Smash Bros. games. Her Screw Attack, Missile, Morph Ball, and Bombs originate from this game. One of her alternate costumes, though ostensibly based upon the Gravity Suit's sprite in Super Metroid, more closely resembles the Varia Suit in this game. Ridley, a boss introduced in this game, appears throughout the Super Smash Bros. series before finally becoming playable in Ultimate. His smaller size and his fireballs' wave pattern are also from this game. One of his alternate costumes resembles his in-game sprite. The main enemies from this game, Metroids, appear as Assist Trophies starting in Super Smash Bros. Brawl. The final boss, Mother Brain, appears as an Assist Trophy starting in SSB4. She is accompanied by Rinkas, another enemy from the game. Planet Zebes is a stage in Super Smash Bros.
Sub-areas of Zebes, Brinstar and Brinstar Depths, are stages introduced in Super Smash Bros. Melee. The Brinstar Escape Shaft is based upon the series's escape sequences, introduced in this game. Norfair is introduced as a stage in Brawl. The Waver, a background element of Planet Zebes, originates as an enemy from this game. The Chozo Statue, a trophy and background element of Brinstar, originates from this game. Kraid, a Melee trophy and Brinstar Depths stage element, originates as a boss from this game. The Screw Attack, which first appeared in this game, appears as an item starting in Melee. Samus Unmasked is based upon one of the possible endings of Metroid, in which Samus takes off her helmet but leaves her suit on. 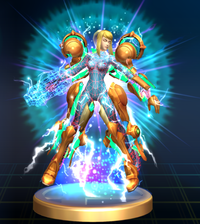 Samus wearing the Varia Suit appears as a trophy in Super Smash Bros. Brawl and Super Smash Bros. for Nintendo 3DS. Samus wearing the Power Suit appears as a trophy in Brawl. Brinstar (64): A remix of "Brinstar" from this game. Brinstar (Melee): An arrangement of "Brinstar", "Samus Appears", and "Title" from this game. Brinstar Depths (Melee): An arrangement of "Kraid's Chamber" and "Silence" from this game. Main Theme (Metroid): An arrangement of "Brinstar" from this game, featuring opening narration from Jay Ward. Norfair: A remix of "Norfair Area" from this game. Ending (Metroid): A remix of "Ending" from this game. Title (Metroid): An arrangement of "Title" from this game. Escape: An arrangement of "Escape" and "Brinstar" from this game. Brinstar Depths: A violin-based arrangement of "Kraid's Chamber" from this game. Victory! Metroid Series: A remix of "Item Acquisition Fanfare" from this game. Victory! Metroid Villain: A remix of "Item Acquisition Fanfare" from this game. Stickers of Energy Tank, Ridley, and Samus are based on artwork from this game. A Chozo Statue, Kraid, the Morph Ball, a Metriod (as two stickers) and Mother Brain appear as stickers in Brawl. Geemer, Chozo Statue, Kraid, Metroid, Mother Brain, Ridley, and Samus appear as spirits. Metroid is available as a Masterpiece in Wii U. The design of the Varia Suit, Samus's default costume, originates from this game. The Gunship originates in this game, and is used in Zero Suit Samus's Final Smash in Super Smash Bros. 4, known as Gunship, as well as appearing in Zero Suit Samus and Ridley's Final Smashes in Super Smash Bros. Ultimate. It also appears in Zero Suit Samus's On-screen appearance in Smash 4. The Gunship appears as a trophy in Melee. The Queen Metroid, which appears as a trophy in Wii U, originates as a boss from this game. The sticker of the Chozo Statue is based on artwork from this game. The Gunship appears as three stickers in Brawl. Spirits of Chozo Statue and Queen Metroid are based on artwork from this game. The Gunship appears as a spirit. Samus's design in Super Smash Bros., Melee, and Brawl is based primarily on her appearance from this game. One of her alternate costumes is ostensibly based on the Gravity Suit's in-game sprite, while another alternate costume more closely resembles the artwork of the Gravity Suit. Samus emerges from a Super Metroid-style Save Station when entering battle. Her dash attack animation is based on the Shinespark, and her Super Missile originates from this game. Ridley's design in Ultimate is primarily based on his appearance from this game. One of his alternate costumes resembles artwork for this game. The Brinstar Escape Shaft is modeled remarkably after Super, particularly resembling the platform-filled shaft Samus had to escape through in Super and the original Metroid, going from a cave-inspired scenery to a mechanical elevator room. The room at the top of the shaft seems to be based directly upon a room in Crateria. Ridley and the Waver's appearances in the background of Planet Zebes are based directly on their sprites from this game. A Chozo Statue that stands up and walks around in the background of the Brinstar stage is based on the Torizo enemies from this game. Kraid takes his appearance from this game in Melee. Ridley's design as a boss in the Subspace Emissary is based on his appearance from this game. Kihunters, which first appeared in this game, appear as enemies in Smash Run. Ridley's trophy is based on his appearance from this game. The Metroid trophy contains a reflection of the Ceres Space Colony on its membrane. Samus in the Gravity Suit, which first appeared in this game, appears as a trophy in Brawl and Smash for 3DS. The Kihunter appears as a trophy in Smash for 3DS. Phantoon, a Zebesian, and a Zero appear as trophies in Smash for Wii U. Theme of Samus Aran, Space Warrior: An arrangement of "Ending" from this game. Vs. Ridley (Brawl): An arrangement of "Big Boss Confrontation BGM (Ridley, Draygon)" from this game. Vs. Ridley: An arrangement of "Big Boss Confrontation BGM (Ridley, Draygon)" and "Theme of Samus" from this game. The sticker of the Space Pirate is based on artwork from this game. Samus in the Gravity Suit and a Zebesian (identified as "Zebes Inhabitant") appear as stickers in Brawl. Spirits of Kraid, Gunship, Kraid, Mother Brain (2nd Form), Phantoon, and Zebesian are based on artwork from this game. The Gravity Suit appears as a spirit. A clip of the Melee introduction features Samus and Ridley fighting in a 3-D re-enactment of their fight on Ceres at the beginning of Super Metroid, with Ridley holding the baby in his talons. Super Metroid is available as a Masterpiece in Brawl and Wii U. One of Samus's alternate costumes introduced in Brawl is a palette swap based on the Fusion Suit. One of Zero Suit Samus's alternate costumes is the blue outfit she wears underneath her Fusion Suit. One of Ridley's alternate costumes is a palette swap resembling Neo-Ridley. Sector 1: A remix of "Sector 1 (SRX)" from this game. Samus in the Fusion Suit appears as a trophy in Brawl. Nightmare, who originates as a boss from this game, appears as a trophy in Smash for Wii U.
Stickers of Samus, her Starship, and a Zebes Inhabitant are based on artwork from this game. Spirits of X Parasite and Fusion Suit are based on artwork from this game. Nightmare appears as a spirit. According to Sakurai, one of Samus's alternate costumes is ostensibly based upon the Gravity Suit from Metroid Prime. However, it should be noted that this alternate costume is also present in previous Smash games that predate Prime. Ridley has a Meta Ridley costume. The first location the player visits in the game, Frigate Orpheon, is a stage in Super Smash Bros. Brawl. The Parasite Queen, a boss from the game, appears as a background character. Meta Ridley appears as a boss in the Subspace Emissary. On the Pyrosphere stage, the Ridley clone's powered-up form is referred to as "Meta Ridley" in the Super Smash Bros. for Wii U 50-Fact Extravaganza video. The design of the Space Pirate and Power Suit trophies are based on their appearances in this game. Sheegoth, Metroid Prime (Core), and Metroid Prime (Exo), which originate as bosses from this game, appear as trophies in Brawl. Opening/Menu (Metroid Prime): A medley of "Metroid Prime Theme" and "Metroid Prime Credits", with unused opening narration. Vs. Parasite Queen: The theme played when fighting a Parasite Queen, sourced from this game. Vs. Meta Ridley: The theme played while fighting Meta Ridley, sourced from this game. Vs. Parasite Queen: A new arrangement of the Parasite Queen battle theme from this game. Spirits of the Gravity Suit, Meta Ridley, and Phazon Suit are based on artwork from this game. The Parasite Queen appears as a spirit, using original artwork. Zero Suit Samus originates from this game. She is able to crawl and walljump, and her moveset revolves around the Paralyzer, just like in her playable portion of Zero Mission. One of Zero Suit Samus's alternate costumes is the orange outfit she wears in certain endings. One of Ridley's alternate costumes is a palette swap resembling promotional artwork of Ridley for Zero Mission. Another costume is a palette swap resembling Mecha Ridley. The Mother Brain Assist Trophy is primarily modeled after her design in this game. Large column-like Chozo statues in the background of Norfair are based upon a statue seen in the Crateria Chozo Ruins in this game. Stickers of Gravity Suit Samus, Kraid, Metroid, Mother Brain, Ridley, Running Zero Suit Samus, and Zero Suit Samus are based on artwork from this game. Spirits of Geemer, Mecha Ridley, Mother Brain, and Ridley are based on artwork from this game. One of Samus' alternate costumes introduced in Brawl is a palette swap based on the Dark Suit. One of Samus' alternate costumes in SSB4 is a palette swap based on the Light Suit. Another alternate costume exclusive to SSB4 is a palette swap based on Dark Samus. Dark Samus, who first appeared in this game, is a playable character in Ultimate. Dark Samus appears as an Assist Trophy in Smash 4. Luminoth appears as a trophy in Brawl. Dark Samus appears as a trophy in Brawl and Smash 4, using her original Echoes design in Brawl. Samus in the Dark Suit appears as a trophy in Brawl and Smash for Wii U.
Multiplayer (Metroid Prime 2: Echoes): The "Hunters" multiplayer theme, sourced from this game. Stickers of Dark Samus, Dark Suit Samus, Federation Trooper, Gunship, Luminoth, Samus, and Warrior Ing are based on artwork from this game. Spirits of Dark Samus, Dark Suit, and Light Suit are based on artwork from this game. Main Theme (Metroid): While based on "Brinstar" from Metroid, this is more specifically an extended version of the remix heard on the Pirate Frigate pinball table in this game. Stickers of Metroid, Morph Ball, and Special Token are based on artwork from this game. All bounty hunters from this game (Kanden, Spire, Weavel, Noxus, Trace, and Sylux) appear as trophies in Brawl. Psycho Bits: The Psycho Bit battle theme, sourced from this game. Kanden, Sylux, Starship, and Weavel appear as stickers in Brawl. Spirits of Kanden and Trace are based on artwork from this game. Dark Samus's design in Ultimate comes from this game. Dark Samus's design and attacks as an Assist Trophy are based on her boss fight. Spirits of Gandrayda and Omega Ridley are based on artwork from this game. Samus and Zero Suit Samus's designs in SSB4 and Ultimate are based upon their appearances from this game. Ridley's design in Ultimate incorporates some details and embellishments from his clone in this game. The Pyrosphere appears as a stage. The Ridley clone is a boss that appears in Pyrosphere. FG II-Grahams and Joulions appear as enemies on the Pyrosphere stage. Zeros also appear as enemies, using their design from this game. Reo, Kihunter, and Geemer enemies in Smash Run are based on their designs from this game. The Samus (Gravity Suit) trophy is based on the Gravity Feature from this game. The Queen Metroid, Zebesian, Phantoon, and Nightmare trophies are based on their appearances in this game. Adam Malkovich, Little Birdie, King Kihunter, Mystery Creature, Vorash, Melissa Bergman (MB), RB176 Ferrocrusher, and Madeline Bergman are from this game. Lockdown Battle Theme: The miniboss theme, sourced from this game. The Burning Lava Fish: The theme that plays when fighting Vorash, sourced from this game. Nemesis Ridley: Ridley's theme, sourced from this game. Spirits of Adam Malkovich, Little Birdie, Nightmare, and Young Samus are based on artwork from this game. Main Theme - Metroid Prime: Federation Force: The title screen theme, sourced from this game. The spirit of the Mech is based on artwork from this game. Zero Suit Samus' design in Ultimate is seemingly influenced by the character design changes she received in Samus Returns, with a lighter and more matte texture for the suit (otherwise nearly identical to the Other M suit in both games) and a more muscular frame. Magmoor Caverns - Metroid: Samus Returns: The lava caves theme, sourced from this game. Boss Battle 4 - Metroid: Samus Returns: The Zeta Metroid battle theme, sourced from this game. End Results - Metroid: Samus Returns: The theme that plays while displaying the clear time, sourced from this game. Spirits of Samus, Metroid, and Diggernaut are based on artwork from this game. Metroid is the only universe with more female than male playable characters. It is also the only universe with multiple characters to have only one playable male character and a female villain not counting Wendy due to being an alternate costume for Bowser Jr.
Metroid is one of two universes to have more than one playable villain, the other being the Mario universe. Of the Nintendo-created universes, Metroid is the only one to have a character (being Dark Samus) created by a wholly-owned Nintendo subsidiary (being Retro Studios). The Metroid series is tied with the Mario, Donkey Kong, and Star Fox series for the most stages not included in Ultimate, being Planet Zebes and Pyrosphere. This page was last edited on April 22, 2019, at 20:56.